Navigate to your WP dashboard->Dokan->Modules. Find Stripe Connect and turn on the toggle button on the top right to activate this module. Toggle On the ‘Dokan Stripe Connect' section to enable it. 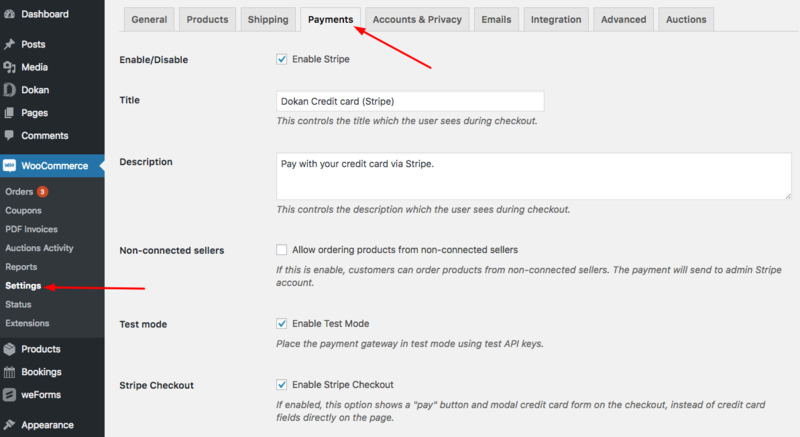 Then click on ‘Manage' to get to the option for Dokan stripe payments as shown below. Check the “Enable Stripe” option and enter Title and Description. The plugin already has default text included, you can change it if required. In the screenshot, we have enabled the test mode to test the payment system. For live transaction, you don't have to check this box. 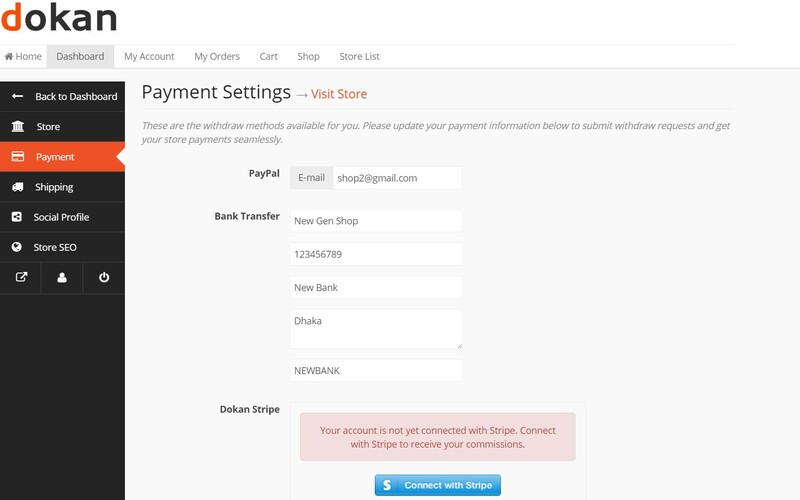 You can enable the Stripe Checkout option. 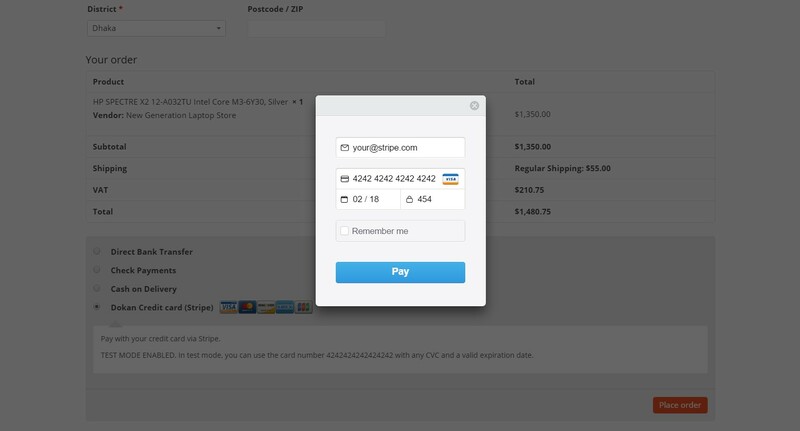 This will show a pay button and modal credit card from the checkout page. This also enables a popup that will open and will ask for credentials to pay. You can either turn this on or off. It is totally optional. The Saved cards option allows users to pay with their saved cards during the checkout process. Stripe serve saves the card details (not on your stores) and this ensure security. The Stripe Settings has Live Credentials and Test Credentials configuration. Here, you have to enter the secret key and publishable key in case of live transactions. You can also test the payment system using the test credentials. All you have do is to enter the Secret Key, Publishable Key and Client ID from Stripe and Save changes. At first, you have to visit stripe.com and sign up. Follow their verification process. If you already have a Stripe Account, just sign in. You will find your dashboard after log-in. Now click on the API option from the left menu. You will find the Secret and Publishable Keys for both Test and Live. 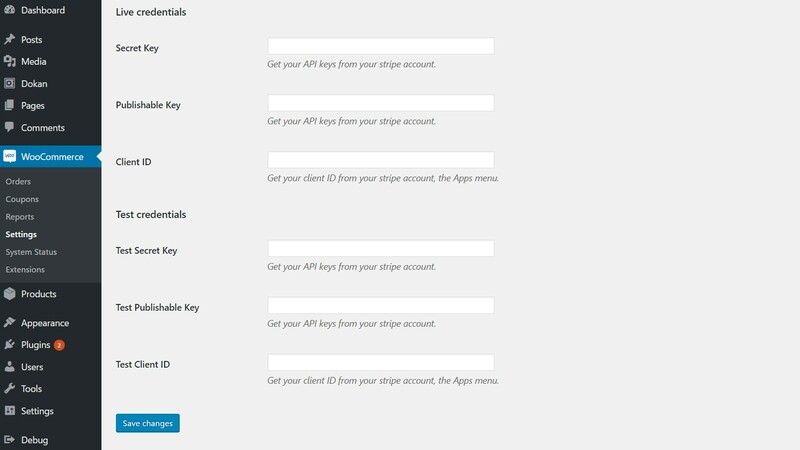 Copy and paste the keys to the WooCommerce Settings. If you are testing, use the Test credentials. For live transactions, use the live credentials. Now, you have already entered the API Keys and the only thing required is the Client ID for live transaction or Test Client ID for Testing. Finally, copy the Client ID under the Development section. This is the credential you have to put under the Client ID in Dokan Stripe Connect Settings. You have got the credentials and entered them on the Dokan Stripe Connect Settings page. Now, save changes. Check the Stripe box and Save changes. 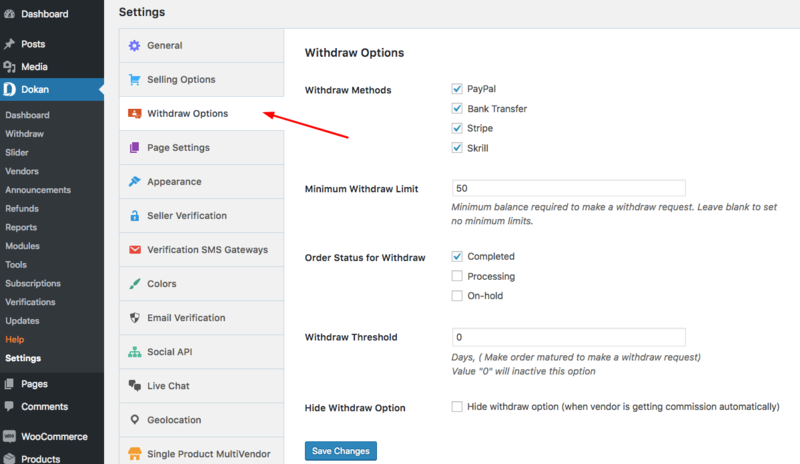 As you have installed a new payment gateway, your vendors should connect their stores to the Stripe Connect as well. 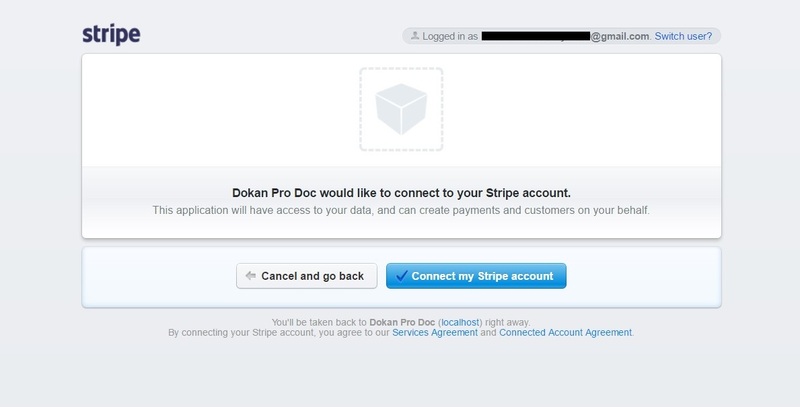 You will see a new option titled Dokan Stripe and asking to Connect with Strip. Click on the blue colored button and you will be redirected to Stripe.com website. 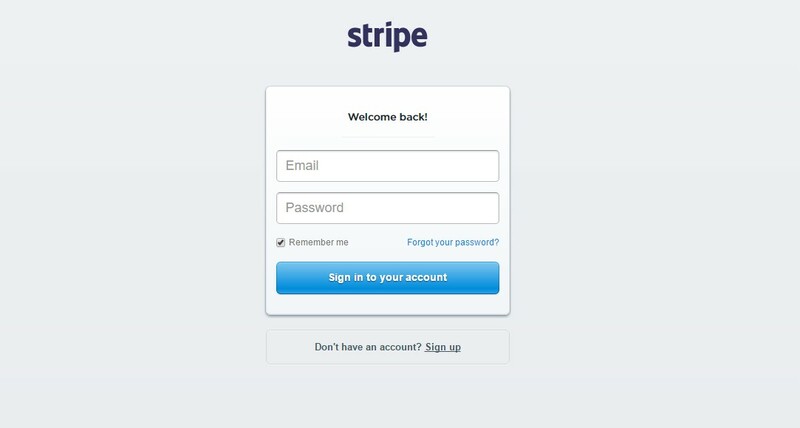 Login with your stripe account or sign up if you don't have one. After logging in, you will see the Marketplace is trying to connect to your Stripe account. Click on the Connect my Stripe account button. 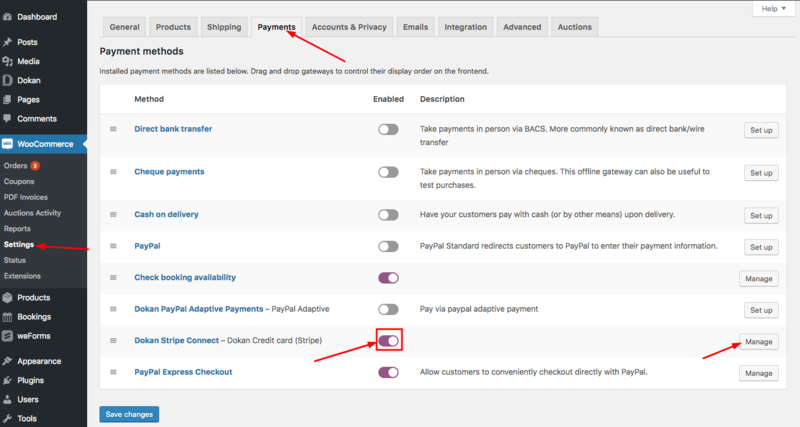 After confirmation, you will be redirected to your store Payment Settings page. 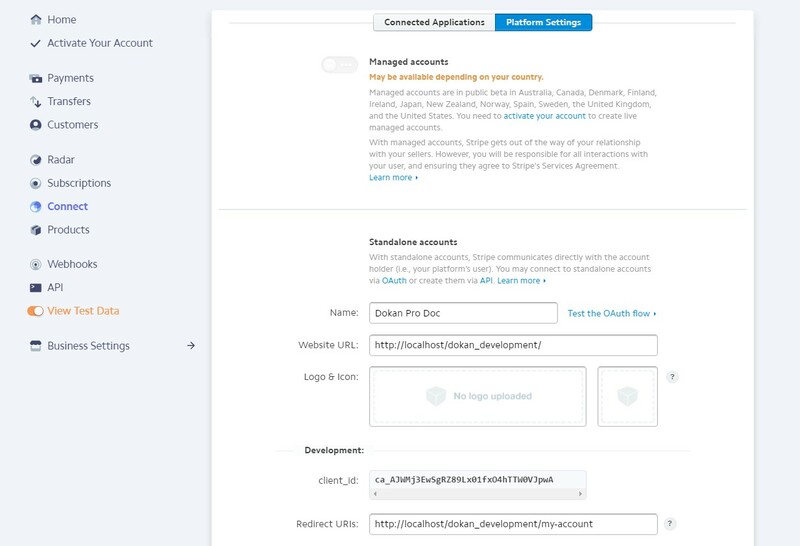 The Dokan Stripe Connect Option will state that it has been connected with Stripe. 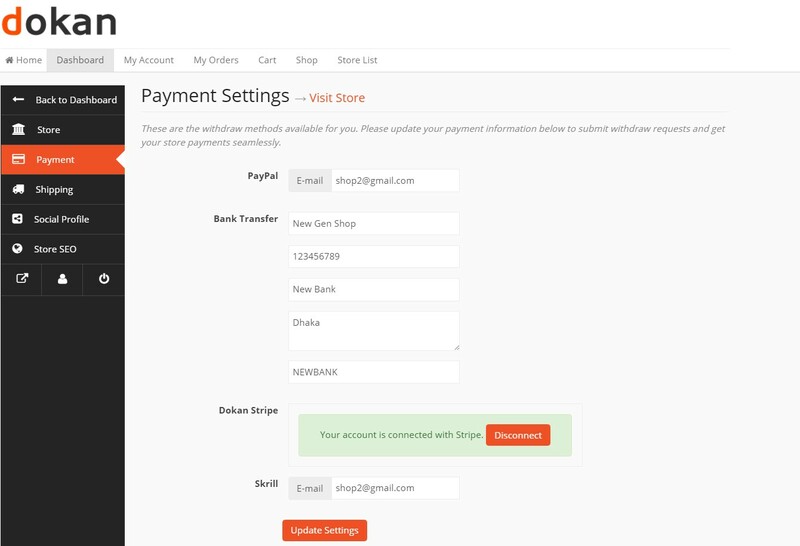 And you are done with setting up Dokan Stripe Connect to your store. There is a disconnect button, which can be used to disconnect your account from this marketplace any time you want. When a customer adds a product to their cart and check in, they will see all the available payment methods. If they select Dokan Credit Card (Stripe), a modal form will appear. The form will ask for email, credit card number, expiry date, CVC. After entering the credentials, click on the Pay button. After payment, the order details will show the payment method as Dokan Credit Card (Stripe).